There is something charmless about the average shopping centre. From a design point of view there has been a concerted effort to juje up the concept in the past couple of decades – opening up structures to increase natural light, modernise interiors, and introduce dynamic lighting and other crowd-pleasers – but the design banality is often barely disguised. Neverthless its convenience and clement conditions whatever the weather still ensure a viable footfall despite the frequently formulaic environment. Meanwhile, the high street withers in the face of high overheads, limited parking (often not aided by council intransigence), relative inconvenience and the universal onslaught of online competition. If modern mall design is shaped by bottom lines and traditional tropes (giant suspended light rings et al), the converted historic building at least has a characterful headstart. The transformation of St Pancras and the architecturally sympathetic integration of its outlets was so far from the model that has epitomised the average station retail offer that it was a revelation. Coal Drops Yard is next door, part of Europe’s largest regeneration project at King’s Cross. 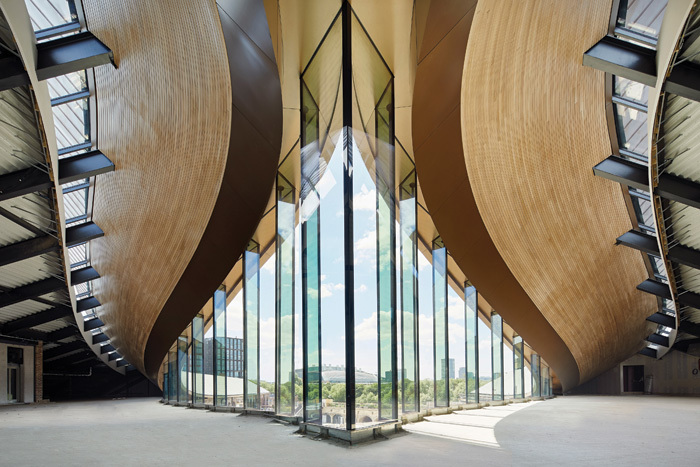 Once again the sensitivity to the original structure is central to the success of the project, a masterclass from Heatherwick Studio in how to repurpose history for the 21st century. The integrity of the Victorian brick building shines through but is made more elegant by the addition of the roof structure. It rises up from both sides, kissing in the middle. It appears seamless and right, as if the building has evolved its form rather than having modernity grafted upon it. Thomas Heatherwick’s Coal Drops Yard in London’s King’s Cross. The first step was to examine how the internal and external levels could be adjusted to make the shops accessible from the public realm. The building is divided into 6m-wide structural bays, the proportions of which lent themselves well to smaller retail units. ‘We complemented these with larger “anchor” stores at the ends of the buildings that could retain the existing floor levels, navigated through internal vertical circulation,’ says Green. The team then introduced a series of bridge links, stair and lift connections in the public realm. These were coupled with frequent routes through the existing buildings to stitch together the neighbouring urban areas such as Cubitt Square, the Regent’s Canal Tow Path and Stable Street. ‘These connections make the site very porous and ease the passing from one space or level to another,’ says Green. Blending ‘art, commerce and culture’, clearly Coal Drops Yard fits into a very metropolitan mould, with a trendy, well-heeled youthful demographic. And by definition, there is a finite number of historic buildings suitable for repurposing as retail centres. But in a highly competitive retail arena such as London it does offer lessons in providing the unique experience that sophisticated consumers crave. ‘In a large city like London we are spoilt for choice, so having the opportunity to rethink the traditional shopping experience was a thrilling challenge,’ says Green. ‘During the design process we looked to other successful retail quarters in London like Covent Garden and the Brunswick Centre. We knew we couldn’t simply emulate these, that Coal Drops Yard had to have its own distinctive character and feel. Coal Drops Yard comprises two heritage rail buildings from the 1850s that now form a new shopping district with close to 60 units, fully opening up the site to the public for the first time. The pair of elongated Victorian coal drops were built to receive coal from northern England for distribution around London by barge and cart. Over the years the ornate cast-iron and brick structures had become partially derelict, serving light industry, becoming warehousing and nightclubs, before being partially abandoned in the 1990s. 'The challenge was to transform the dilapidated buildings and the long, angular site into a lively retail district where the public could gather and circulate,’ says Heatherwick. The design extends the inner gabled roofs of the warehouses to link the two viaducts and define the yard, as well as making circulation more fluid. 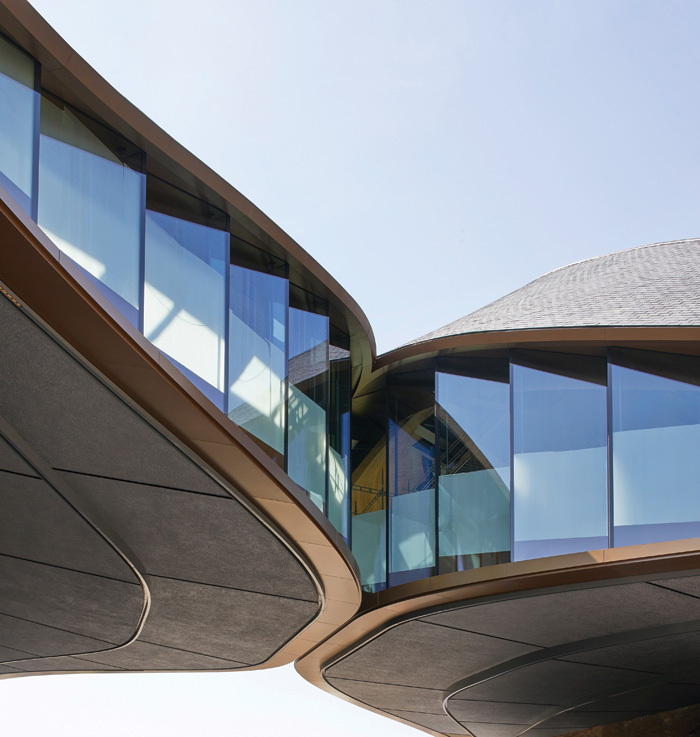 The flowing roofs, supported by an entirely new and highly technical freestanding structure interlaced within the heritage fabric, rise up and stretch towards each other until they touch. This introduces a completely new floating upper storey, a large covered outdoor space and a central focus for the entire site. The scheme creates 9,300 sq m of new retail area, as well as significant public space. The units vary in size (ranging from 15 sq m through to more than 1,900 sq m), accommodating a wide range of established – Cos, Fred Perry, Paul Smith, Tom Dixon – and emerging brands, alongside new restaurants, bars and cafes. At the less gritty end of the historic-building spectrum, London’s Great Portland Street in Fitzrovia was built in the 1700s as part of the Duke of Portland’s Estate. A typically eclectic mix of buildings, it mingles Victorian, Georgian and modern architecture. 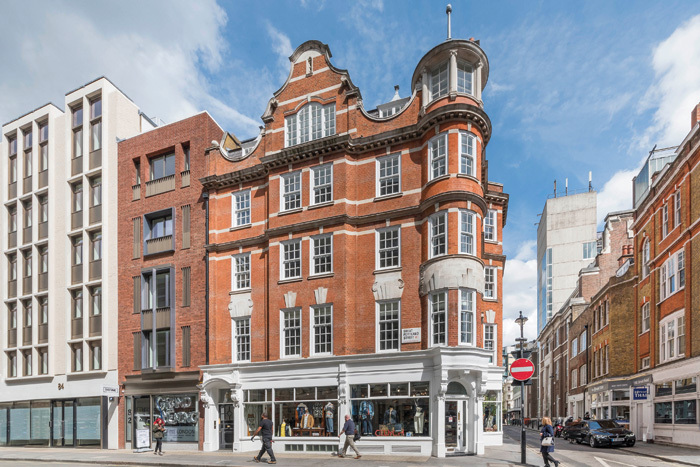 In a recent mixed-use development by Lifschutz Davidson Sandilands, the ad hoc collection of seven buildings at 78-92 Great Portland Street were transformed into new retail outlets, together with modern residences and office space. ‘It provides an interesting example in the light of the Great British High Street campaign and ongoing reports of how high streets need to evolve to compete with online retail,’ says LDS, which has been involved with Foyles, Bonhams, Harvey Nichols, Sainsbury’s and Liberty among many other retail schemes. In order to reinvigorate the stretch and to increase the appeal of the historical facades the exercise even involved incorporating an entire frontage moved from the neighbouring district of Soho. At street level, the seven new independent retail outlets include The Whisky Exchange, luxury nail salon Townhouse and Japanese fashion brand Clutch Cafe (a spin-off of the Japanese men’s fashion magazine). In London’s shouty, highly competitive retail environment, it was an advantage to create a strong personality for the development, says Parkin. ‘Utilising the existing, quirky prominence of the store on the street. A characterless 1980s shopfront was replaced with a heritage frontage from Soho. The highly modelled, period timber and masonry shopfront required careful dismantling, restoration and refurbishment before reassembling in its new location. The move not only increased its character but also flooded the space with natural light. 'The use of a heritage structure can lend a sense of establishment to a new independent retailer,’ says Parkin. The 'as found’ condition creates a unique canvas. In this instance, buildings that were once car parks or office receptions, car showrooms and so on are now shops. and unique nature of the historic fabric enhances the physical retail experience and acts as an aid in brand building – providing an identity which can then be translated online.